Don’t tell anyone, but…you may have noticed that we here at BBS didn’t announce that the 28 Days Later submission window was open. It’s because the campaign is “under construction.” It will be alive and well in 2012, but how we’re selecting authors this year is different. So stay tuned. We’ll get you all up to speed closer to campaign time. We’re pleased to welcome our two newest members, children’s authors dedicated to the cause of entertaining kiddies through literature. It’s no secret that it takes a large amount of sweat equity to highlight books and authors. Even less of a secret is that when you want something done, you go to the busiest person in the room. Authors are always the busiest people in the room. Guaranteed! So we’re excited that Gwen and Crystal have added the labor of love that is 28 Days Later to their already full plates. 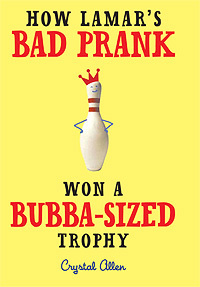 Crystal is the author of MG, How Lamar’s Bad Prank Won a Bubba-Sized Trophy (Harper Collins, Feb. 2011). And she’s also ambidextrous. My inner twelve-year old isn’t sure which of those is cooler! Gwendolyn, is the author of 11 (count ’em), eleven children’s books more than half of them easy readers. So she’s getting to our babies nice and early, when we need them to fall in love with words. We believe they fill out our roster of dedicated children’s authors quite well. Please, give them a hearty welcome. Welcome to the harmony, folks! It’s always good to reevaluate how a thing happens – I know others in the kidlitosphere are doing that, too, so looking forward to how 28 Days Later turns out this year. Big Congrats, Crystal and Gwen! Thank you tadmack and LaVora! 28 Days Later 2012 won’t disappoint.